Good Walking Straight From The Door! Being enthusiastic hill walkers ourselves we have always been keen to walk straight out from Finca Montaña rather than getting in the car and driving to get to the start of a walk. Sure, there are great walks elsewhere in the Alpujarra but here at Finca Montaña there are our own great circuits. The problem with planning a route and exploring around here is the fact that although a path or track might be shown on the map, it either may not exist or be over private land and you have no way of knowing until you arrive at a chain across the track half way around your walk. Earlier this week we pieced together another amazing circuit from the house. Even after living here for 10 years, it’s such a joy for us to discover something new. Passing mountain farmsteads like our own and seeing what’s growing, old mines, acequia’s, abandoned farms and terraces and never seeing another sole except for a farmer pruning some almond trees. The spectacular views, geology, and wildlife are a wonder too. On this latest circuit we saw a juvenile Golden Eagle, Iberian Ibex and Kestrels. In addition to a host of shorter walks, we now have 4 superb day walks straight from the front door. All of them circuits of around 10 miles and with 600m to 1000m of ascent. Quite strenuous days but the good thing is there is always a mug of tea or beer / wine to reward yourself with at the end of the walk. There’s nothing like your favourite tipple when you’ve earned it and the views from here are truly stunning. Finca Montaña is a great, reasonably priced, base for walkers to enjoy the spectacular hill and mountain walking that the Alpujarra and Sierra Nevada have to offer. Walking is possible throughout the year in The Alpujarra though it’s a good idea to miss the heat of August. Even in January and February it is often possible to walk wearing a T shirt. Walking in the High Sierra Nevada is cooler! The best months are June, July, September and October though if you fancy some snowshoeing (possibly combined with some warmer walking in the Alpujarra), February is a good time to visit. At Finca Montaña you can have a flexible accommodation option, B & B, Half Board or Full Board at reasonable prices. We also offer airport pick ups from either Malaga (2 hours) or Granada (75 minutes). Mike and Jane the owners of Finca Montaña are both qualified International Mountain Leaders with an extensive knowledge of walking in The Alpujarra and Sierra Nevada. They work together at Sierra Nevada Guides. 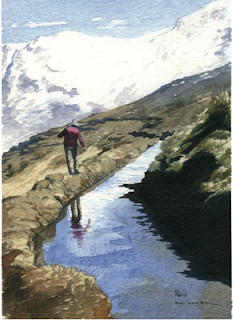 I came across a wonderful publication today called Manual del Acequiero; it is a guide to building and maintaining the water channels which criss-cross the mountains of the Sierra Nevada and Alpujarra of Southern Spain. If any of our readers have walked with us, they will be aware that we often walk along acequias; they have paths running alongside to offer access for owners of the farmland beneath, and are a great and often adventurous way to explore mountain terrain. Acequias are of course much more; they provide essential water to the local communities, and in the Alpujarra keep the mountainside wonderfully green, even in the height of summer. At Finca Montana, our cortijo on the mountainside above Lanjaron, we are very fortunate to have lots of springs which provide our water supply and keep our land irrigated. These springs are fed by the acequia and without these ancient irrigation channels, the springs would dry up. We had a reall scare earlier this year when our acequia collapsed down the mountainside. However it was soon restored - demonstrating how important the water is to the local community. Acequias are not unique to our part of Spain; originally built by the Moors of north Africa, they can be found in many other countries, including the high Atlas of Morocco, Madeira (where they are called Levadas) and even Switzerland (where they are called Bisse). The Manual del Acequiero provides guidance for rennovating the acequia with lots of pictures demonstrating how they are built. Often the acequia would have been lined with massive stone blocks, which can still be seen in the Alpujarra and Sierra Nevada. The stone and materials would have been brought in by the acequiero and his mule. Why not come and stay with us at Finca Montana and take a walk along our acequia, or meet Pepe, our very own Acequiero who walks past Finca Montana most days with his goats.